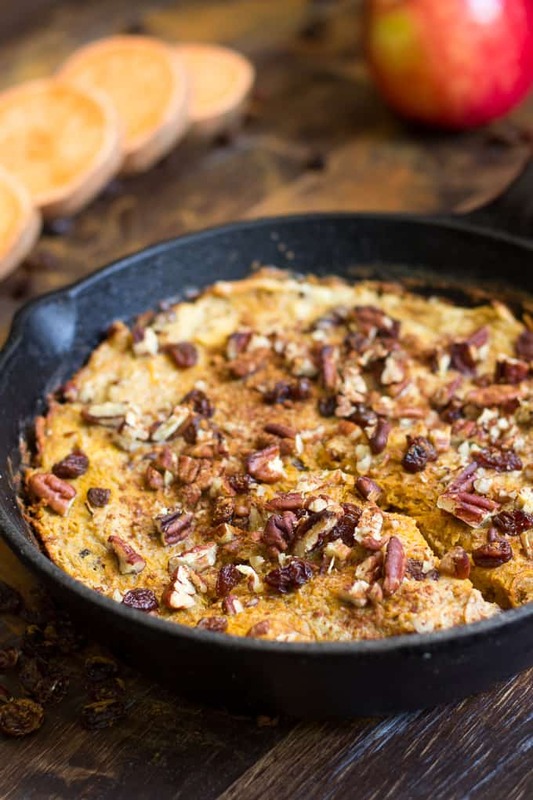 This naturally sweet, Paleo & Whole30 friendly Sweet Potato Apple Breakfast Bake is quick and easy to put together and great to make ahead too! 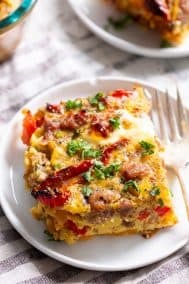 When you’re craving a sweet breakfast and want something simple and comforting, this breakfast bake is the perfect option. No added sugar or sweeteners, dairy free, just a few ingredients. As much as I love a license to eat bacon or sausage with eggs every single morning (and you KNOW I love it!) I totally get that there are times when you need something sweet, yet still “sugar-free”, if that makes sense. 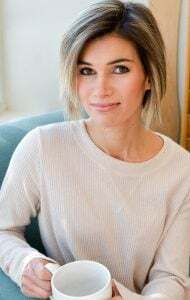 The problem with Paleo breakfasts (my recipes included) is that they tend to be savory all the way, heavy with greens and veggies and meat, or something a bit too sweet – like pancakes or muffins. And, if you’re looking for something Whole30 friendly and sweet, it can be hard to come by. And we’re not counting apples with almond butter (although yummy) because it just doesn’t feel like a real breakfast. Back in my days of strict Whole30 eating, I came up with a sweet potato noodle pie that was the perfect mix of naturally sweet, yet wholesome and filling – no added sweeteners or flours of any kind – just fruit, sweet potatoes and eggs. I wanted to do something similar but far more simple – since not many of us are up for spiralizing a sweet potato early in the morning. 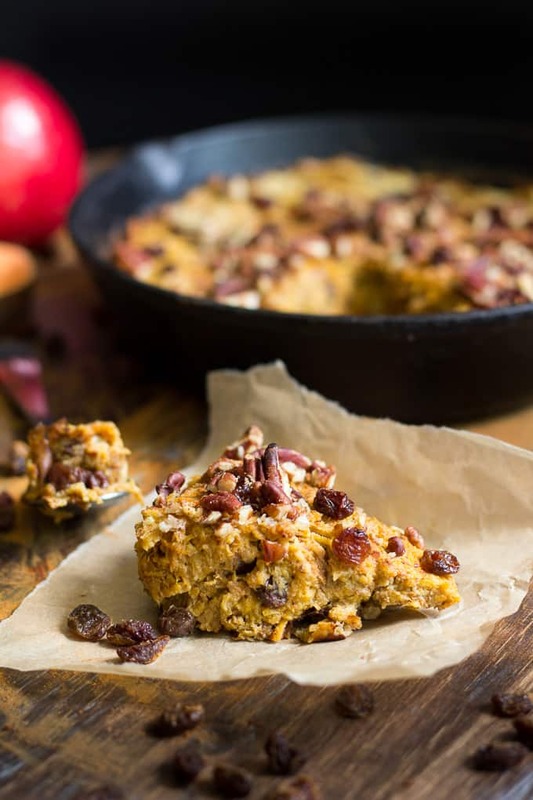 Enter this Sweet Potato Apple Breakfast Bake – you get the “full” factor from eggs and coconut milk, plus the “sweet” factor from sweet potatoes, apples and raisins. Yes, it requires shredding the potato and apples – BUT this is easily done the night before, or, if you’re the motivated morning type – it’s really just 2 minutes extra of your time. Even less if you’re married to your food processor like I am. Good thing we can be married to more than one kitchen gadget. Kitchen-tool monogamy would be horrible! What to choose? I use so many of them every day. Blenders and food processors get some really tough jobs done, but, I think the coffee maker has my heart and soul. Hmm, but if we start counting things like knives and skillets, it gets really tricky, because I NEED them to actually survive. And, I might still choose to skip through a field and go for a long walk on the beach with my coffee maker though because that love runs deep. The breakfast bake! 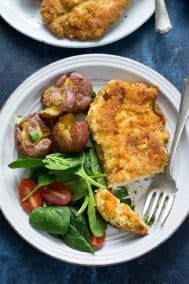 I made this from start to finish in my favorite cast iron skillet and I highly recommend you do the same! I’ve also been known to eat right out of said skillet, especially lately in the mornings when I’m in a rush. If you’re going to attempt anything like that in your own home, MAKE SURE you use an oven mitt – maybe on both hands. Just saying! 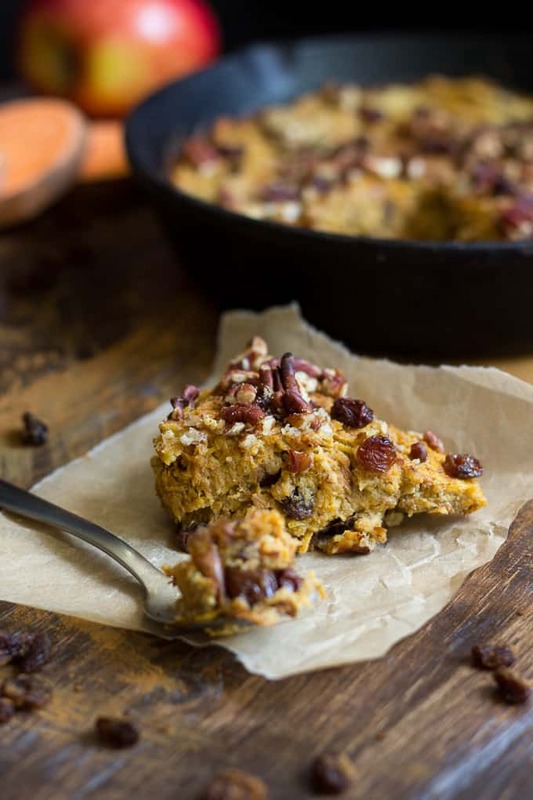 This sweet potato apple breakfast bake is Paleo and Whole30 friendly, with no added sugar and perfect when you crave a sweet, comforting yet healthy breakfast! Preheat your oven to 400 degrees and heat a medium skillet* over medium heat and add the coconut oil to the pan. 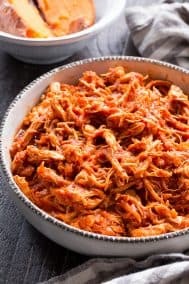 Add the shredded sweet potatoes to the pan and cook until they begin to soften and brown, then add the shredded apples, salt and spices. Continue to cook over low-med heat about 5 minutes, then add the whisked eggs and coconut milk to the skillet** and mix to combine. Stir in the raisins, spread the mixture out evenly in the skillet, then sprinkle chopped pecans over the top. Bake in the preheated oven for about 10 minutes, or until the eggs are set and beginning to brown. Want more Whole30 friendly breakfast ideas? Try one of these! Do you prefer sweet or savory breakfasts? What does your family like? i want to make this asap! I don’t know if I have coconut milk in the pantry – do you think I would be fine with almond? I think? Less creamy maybe? Stick together less? It would taste fine though! I am slowly getting back to Paleo this coming New year…I didn’t have coconut milk so I just used 2% milk with a splash of heavy cream. But I will slowly stock my pantry with all the essentials….Thank you for the recipe. I am dairy free bit allergic to nuts and coconut. Could i omit and use a dash of vanilla? Or use apple sauce? That might work out, let me know how it goes! Those sounds so good! Skillet pies and cakes are definitely my thing lately, but its nice to have something not overly sweet. I would marry my coffeemaker if I wasn’t already taken. I like it more than wine these days. Also oven mitts are a must. I can’t tell you how many times I burned my hand when I forgot the cast iron skillet was in the oven and not just on the stove. Oops. On the Eggs, you don’t cook them like scrambled eggs correct? I’m a little confused? This will be going into a baking dish once the sweet potatoes and apple have cooked for me. If you do this all in one skillet, you whisk the eggs and coconut milk before pouring into the skillet and mixing with the sweet potato/apple mixture. If you don’t have an oven proof skillet I recommend combining the whisked eggs and coconut milk in a bowl, then combined both mixtures before transferring to a baking dish. You’re not scrambling the eggs in the pan. Hi! Would you recommend 8×8 pan if we dont have a skillet? What size skillet are you using? I have a 12 inch. Is that too big? What size baking dish if we are transferring? Are the eggs the star here or just a binder for the other ingredients? I ask because my daughter doesn’t “do eggs”, but does like sweet potatoes. If the SP shreds are the star, I think I could make this work for breakfast with a chicken/apple sausage on the side. Yes they’re more of a binder that make this a “bake” rather than a mash or porridge sort of thing. This is such an amazing whole 30 breakfast idea! Ii almosts looks cake like! So hard to find sweet whole30 breakfast ideas. Something I need to work on! Love how quick and easy this is! And the flavors are perfect for fall! 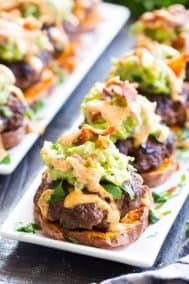 You have some wonderful recipes, but so many ads on your blog that I can’t read the recipes. It’s very, very annoying! Apologies! Let me know if there is a specific ad you can’t x-out that’s blocking the recipes and I’ll look into removing it. Thanks! This looks so good, but I am unable to eat apples. Do you think it could work with another fruit? Any suggestions? Thanks! Anything that can be shredded or grated would work, maybe pear? Otherwise you can use all sweet potato instead. Delicious recipe! Mine did not come out as visually appealing as yours did, but the flavor is wonderful and it is a nice change from the eggs and sausage standard. Thanks for sharing! I added more coconut milk thank called for on accident, will it ever harden up? I have cooked it 20 minutes so far. Hope it still tasted okay? I wonder if this would work baked in little individual muffin tins! I’m going to try it and see what happens! Has anyone frozen the leftovers? I imagine this might make 8 muffins with a 2-muffin serving, and I don’t want them to go bad. Can this be prepared ahead then brought to room temp and then baked? I would say yes with the exception of the egg, just whisk in the egg right before baking. I would love to see more photos of your cooking process here. When you say “grated”, how big should the grated pieces be? Would it be ok to use applesauce instead of grated apples? I think I grated the sweet potato too thick, and the apple too thin. Couldn’t really taste the apple. I want to try again soon and see if I can make it resemble yours better ? Thanks for the feedback about more photos – definitely something I’m working on for future recipes! As for the grating, I used the same size for both but since the apple has a higher water content it can get “lost” in the sweet potato if that makes sense. I think applesauce would be too mushy for this since it’s already cooked but if you were to try, I’d say to mix it in near the very end right before baking when you mix the egg and coconut milk in. Hope if works next time! Thanks for this recipe!!!! It is awesome and so healthy! I’m amazed at how sweet it is and I don’t even add the raisins! Sweet Potatoes vary so much in size, I’m curious, how many cups of grated sweet potato are you using in your recipe? Thanks again! Hi, glad you like this! I’m actually not sure what the measurement is after grating, it’s a pretty forgiving recipe so size variance shouldn’t matter much. Hope that helps! I was a little skeptical about making this, however I was pleasantly surprised! It was amazing! We will definitely be making this again! I made this morning and it tasted like thanksgiving! Except…I’m thoroughly convinced it’s impossible to grate a raw sweet potato! Haha I used to do it occasionally before I got my food processor! Now I just use the shredding attachment and it’s done in a minute. Glad you liked it! I agree!! Just like thanksgiving!! Do you think if I prepped this on Sunday, would it keep all week for breakfasts? Hmm, I think it would be fine for 4-5 days. I never kept it more than about 3 myself (just because we ate it all) so I’m not sure how the texture would be affected sitting all week. I have made this delicious dish! I have leftovers.. i was wondering if i can freeze my left overs? I haven’t tried it but I don’t see why it wouldn’t work! Love the recipe! Just tried it, absolutely delicious!! Question: How did you get yours to be so smooth looking? My still looked like shredded pieces of apple and sweet potato. In Sept. I was blending ALL my food and could barely eat. Doctors didn’t and still don’t know why. What saved me was the GAPS & PALEO diets. After seeing and saving several recipes, I noticed after a while that most of my favorites come from you. Thank you for being a part of my recovery and making the transition easy and delicious. God bless you! ? I tried the recipe and it looks nothing like the picture. After 10 minutes of cooking everything is not cooked and after 20 minutes it’s getting better? Did anyone else have this issue? 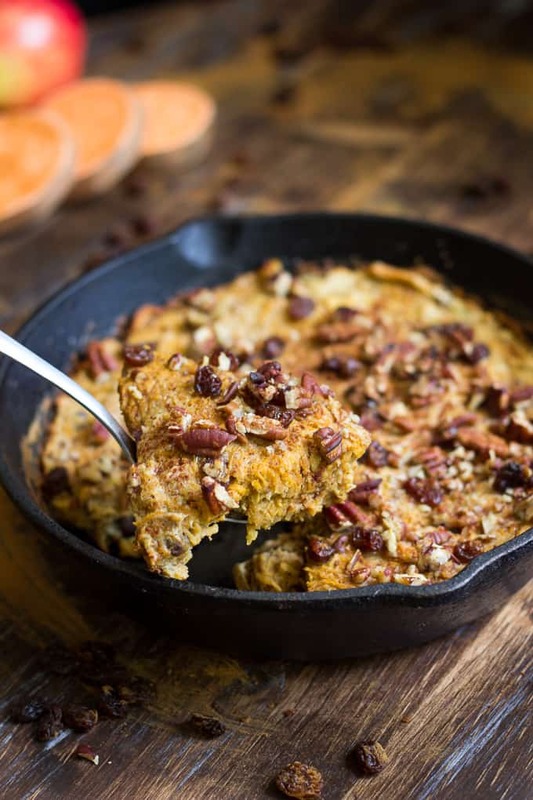 Are you using a cast iron skillet or a baking dish? I’m thinking perhaps the oven temperature is running cooler for you, it shouldn’t seem completely uncooked. That said, the final product is not a bread like consistency, but rather more of a pudding/pie. I made this last night and warmed up for breakfast this morning. It was a nice change from eggs.I will make it again. It has a nice cinnamon flavor and adding pecans really made the dish. Don’t expect it to be like a sweet cake, but it does have a bit of sweetness from the apple/potato/milk. I did not have coconut milk and used almond. That may have resulted in a less creamy texture? Mine didn’t look like yours. The sweet potato was still in it’s shredded form,but I don’t think it changed the flavor, just the texture. I’m wondering if it should be cooked longer until it gets to more a mashed form? Thank you for the recipe! it was very good. Hi! I was just wondering if this recipe actually makes enough for the cast iron pan? And what size? The ingredients do seem like enough for a 10 inch pan. I would love to try it though! I actually made this from start to finish in my 8-inch skillet, I think a 10 inch would be too big and you’d just wind up with a thin layer on the bottom. That said you can also make it in an 8″ square baking dish, greasing it first and transferring the skillet mixture to the baking dish before going in the oven. Delicious! I’m just trying Whole30 for the first time and this was a yummy breakfast for one who prefers more sweet to savory. Baked for 20 minutes (non cast-iron) and came out delicious! I can vouch for this recipe! I made it today and I love how sweet it is without any added sugar/junk. I made it for my husband and myself, but the kids wanted it too. Great! So happy to hear you liked it!! My husband is allergic to coconut. What can I substitute for the oil and milk? To keep it whole30 friendly you could use ghee to replace the coconut oil and almond milk (or another compliant dairy-free milk) instead of the coconut milk. Love your recipes but dislike the stories. Can you share recipe first? 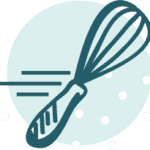 I like to write the text for the post first to give some background and also provide tips for the recipe itself. Of course not everyone who visits will want to read all of it but it’s easy enough to scroll through a few paragraphs to see the recipe. I made this and it was delicious! It did seem to come out mushy, any recommendations for making it less mushy it is that the consistency of the dish? Either way I am making it again ? thank you! I would say it is sort of mushy, but to keep it “together” more you could try removing excess water from apples and sweet potatoes and also perhaps adding an extra egg to bake it with? Just a thought, I would go with removing water first and see how that goes. My apples were small, and I still used only one, so mine didn’t come out too mushy. If using a large apple, maybe you could squeeze it in cheesecloth after grating but before cooking? Canned coconut milk is very thick and creamy and definitely adds to the texture! Blend it to a smooth consistency before adding, since it often separates in the can. Michele: Can you please clarify/confirm that the recipe, as you have formulated it, clearly calls for coconut milk from the CAN and not the kind from the fridge (i.e. the “almond milk”, “cashew milk” breeds). I’ve been curious about this since I’ve been reading Whole 30 and related recipes which call for coconut milk. I inferred that they/you mean the kind in the can, because the specification “full-fat” would only make sense if we’re talking about the canned kind. I’m sure many people (e.g. the ones on this tread who aren’t achieving a satisfying texture) are having this same confusion— “coconut milk” is ambiguous and could mean either the fridge milk or the canned milk. Could you please verify which kind you used in the original recipe? Thanks, I appreciate it. I plan on making this today or tomorrow. We loved the recipe! We doubled it to make more for the week, except it never hardened just stayed moosh the whole entire time. We cooked it for almost an hour, is it suppose to harden any? Just made this. I don’t have a cast iron skillet, so I used a regular skillet to cook the sweet potato and apples, then transferred to a 9×9 baking dish for the rest. It worked out great. Delicious!!! Thanks for sharing! I love this recipe! However, it really should not be considered “Whole 30” as it is not in keeping with the concept behind this way of eating. Sweet recreations are not Whole 30-approved recipes. Whole 30 supports 3 meals a day with a specific amount of protein, fat, veggie and fruit per meal. No snacking or sweet alternatives, even with approved ingredients! And Whole 30 definitely does not support giving into sweet cravings or foods we find “comforting” as one of the main goals of your 30 days is to avoid feeding our “sugar dragon” and change our relationship with food in a more appreciative way! Just something to think about! Glad you like the recipe, however I have to disagree with you completely on the other part of your comment. 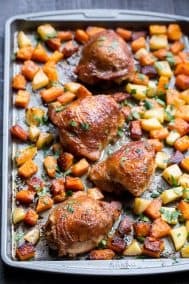 While I totally get the concept of SWYPO, this recipe is not recreating traditional junk or even sweet food in any way – just combining veggies and fruit and baking it into something you can eat for breakfast, portioned however you see fit, with other components such as veggies, eggs, whatever. I’ve seen many people on Whole30 tag my recipe showing a plate where they have a portion of this along with sautéed spinach, eggs, even green salad. 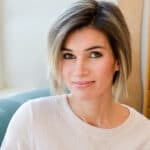 I agree that things like chia pudding, banana ice cream and anything in pancake or waffle form doesn’t meet Whole30 guidelines for emotional component of the program. That said, literally ANYTHING can be “abused” on whole30 (nut butter, dates, etc) and if this type of recipe puts someone at risk that way then they can simply avoid – doesn’t mean it can’t be a part of Whole30 for others. You specifically say that it’s for when you’re craving something sweet. When you’re doing Whole30 and ‘craving something sweet’ the VERY LAST thing you should do is look for something sweet. It will only hinder attempts to get rid of the craving. Don’t FEED it! Part of Whole30 is getting rid of habits like this. You don’t mention that it’s not a meal, it’s a side dish to be accompanied by appropriate portions of protein and probably more veg and fat. 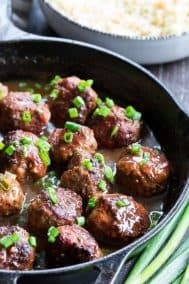 what size cast iron skillet should I use for this recipe? I made this in the oven doing everything as directed and after 10 minutes it came out still quite gooey and mushy. I put it back in for another 25 minutes and it came out still quite moist, more like a sweet potato frittata. Tastes delicious, just not sure what I did to make it so it it’s not baking the same. Any thoughts? 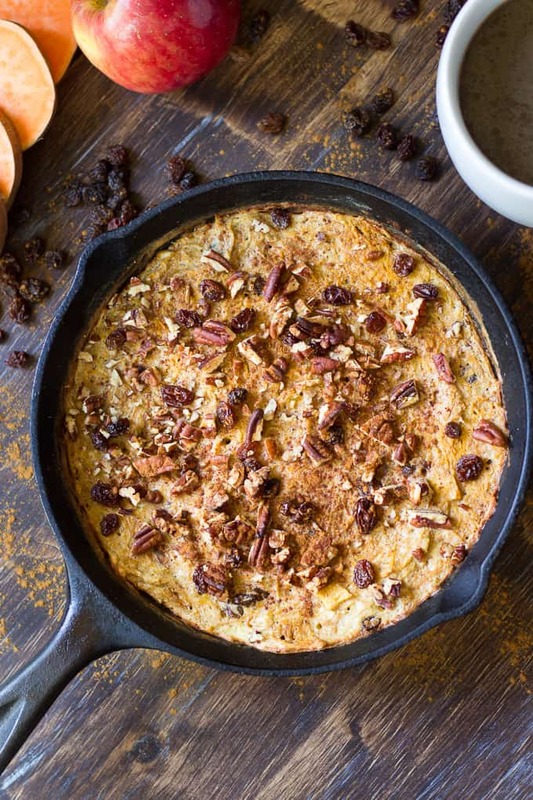 It doesn’t wind up like a cake, it will stay a bit frittata like, however if you want to reduce moisture for next time you can squeeze all the water you can manage out of the apples and sweet potatoes, even after sautéing, that should help! I just wanted to say I LOVE this recipe, and since my first Whole30 I’ve made it almost once a week regardless of how I’m eating. I alternate between sweet potato and squash “noodles” sometimes I use an extra egg, always dump a bunch of extra spices in it and put coconut flakes on top too!! It’s so flexible!!! Also great with a splash of almond and vanilla extract sometimes! Seriously, one of the best, flexible, easy recipes I have yet to tire of!! Is this something that can be made with precooked sweet potatoes? Or does it have to be raw? I have never posted a comment before but I have to this time. What a fantastic recipe! This makes doing The Whole 30 so much more manageable, a game changer for sure. I will be using this post Whole 30 and for many breakfasts to come. It gives me the energy I need to get through the morning and I don’t feel hungry until lunch. Delicious, and the house smells fantastic! Thanks for coming up with this gem! Hi Michele, quick question. I am egg intolerant and am not eating any at this time. I have read the comments and seen where the consistency of this dish is not cake like or such, so in your opinion, do you think flax eggs would work? I read where the eggs act as a binder only; so I was thinking that this may work. This sounds delish and I am looking for breakfast options since I am also off all wheat and dairy as well. Hi there! I’m excited to try this! You mentioned you use the shredder attachment to your food processor for grating the sweet potato/apple. Can you recommend a food processor? I don’t have one and would love to stop grating my knuckles! Thanks! I tried this and loved it but my didn’t come out as thick. What size skillet did you use? Also how long should it last in the refrigerator? This took a lot longer than 10 minutes to fully bake for me. It was closer to 30 minutes. I also used sweet potatoes out of the fridge and transferred everything to an oven save dish so that may have been the cause of the delay. I think transferring it from the hot skillet impacts the baking time. I’ll make a note of that in the recipe! This is so good, I never used coconut milk before. Didn’t know I needed to stir it until after I scooped it into the skillet. Oh well it didn’t hurt it any. Yum, will be making again! This is Ahhhh-mazing!!! 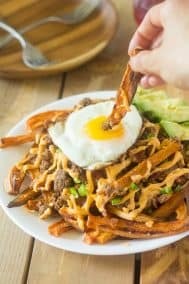 I’ve been trying to find something Whole30 compliant that was not based in eggs and this is perfect! I can see how easily I will be able to adjust the basic recipe based upon the ingredients I may have on hand and still have a great end breakfast! Thanks for sharing—-and not having exact measurements! ? I’m so thrilled you liked it! can you substitute chia or flax eggs for the egg? @klara did you try the flax egg? Can you make this in a 13×9?? I’d like to double it and not have to make it twice. Approximately how many cups of grated sweet potatoes? Loved this recipe!!!! Do you think canned pumpkins would work instead of sweet potato? I only ask bc sometimes I’m so tired of sweet potatoes and I have yet to work pympkin into my diet. If so, how much canned pumpkin if you had to guess? Maybe 1/2 can?? Thanks!!!! I definitely think it could work but I’m not sure what amount, you could try 1/2 can and see how that comes out, adding a bit more if you need. Hi Michelle, does the cooking time need to increase if you’re using a baking dish? At 10 minutes mine still looked raw and not set. It has been in for closer to 20 now and still not loving the constisency of it. It is still really runny. Yes I would think the baking time would need to increase but it shouldn’t be longer than 20 mins. I’m thinking more water needed to be squeezed from the apples or things needed to be cooked a bit more before baking. Hi Michelle, that is not included in the directions. Is this something you recommend? I know I do in other sweet potato recipes. But I didn’t this time. Sorry it didn’t work out! This really isn’t an egg dish, they’re just to help bind the other ingredients a bit. Not for everyone. I have not used a mix of sweet potatoes, apples and coconut milk before. It will definitely be something different to try out for breakfast. I like the inclusion of the spices and fruit and nuts which gives the bake some added flavors and textures. Am doing Whole30 and needed to find something new for breakfast. I try a lot of recipes in general and don’t always comment, but couldn’t wait to comment on this one! It is absolutely delicious! Reminds me of sweet potato casserole at Thanksgiving. In fact, I just might sub this next year. Definitely a recipe that will become a staple in our house! AND you now have me cooking with coconut milk – as a non-coconut lover (except in shampoo!) something I never thought I’d do. Thanks! This was so delicious! I made it pretty much as written and had it for breakfast for several days. Totally satisfied my cravings for carbs in the morning and was very satisfying. Was not hungry till lunch. I plan to make it again today but will add nuts and raisins into the mix before baking as I think I would prefer them incorporated into it rather than sitting on top. Really yummy and I so appreciate your sharing your recipes. They are helping me get through the Whole30 diet w/o feeling deprived. This became a staple during my Whole30 last month. I used leftover baked sweet potato instead of grating it, and I added it to the other ingredients with sauteed diced apples. I also had to bake it in ramekins because I did not have a cast iron skillet available. After Whole30, I played around with the recipe and added 1/2 tsp vanilla, 1/4 cup of almond flour, and 1T of coconut flour to absorb some of the liquid to make it more of a treat. It is now my go-to breakfast for Saturday mornings making it my weekend splurge. Thanks for sharing! Hi,I just made this in a 9 inch baking pan. Smaller would probably be better it was very thin. It also took about 20 minutes? Maybe because the pan wasn’t hot like the skillet would be. The eggs were firm but not browning so I took them out around 22 minutes. Should I have left it in longer? It looks like you might have sprinkled something on yours. Cinnamon? I made this and loved it! Would this freeze well after baked? 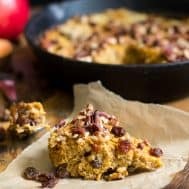 Would the Sweet Potato Apple Breakfast Bake freeze well? Maybe it could be frozen before baking? Also, I can’t seem to find the nutrition information. First of all, this was amazing! My 5 year old thought it was dessert it was so good. But I was wondering if Adding a little almond flour might make it more like a cake consistency? Thoughts? It’s really good flavor, but mine didn’t seem to set as well as your picture. I’ll make again though. Love love love this receipe. Fall is in the air and this is perfect with a cup of coffee while snuggled up around my patio fireplace! Hi & thank-you for the recipe, Michele. I’m on a Paleo path & so needed a change from eggs. This is a delicious, healthy alternative. I made the mistake of starting out using a large cast iron skillet. I’m guessing this recipe would work best in a 8-10″ skillet? I ended up putting it into a 9″ round cake pan @ the last minute & it came out pretty flat (but tasted great). As others (& Michele) said, it does not come out looking like cake. It’s like pudding. I love nutmeg, so doubled it (use the nut though, so not sure if that changes the strength). Next time I think I’ll double the recipe. The pecans add so much, I’d recommend using! I will love having this in my rotation. Finishing up Whole 30 and looking for some exciting and new flavors! LOVED this recipe! Easy, spot on directions, flavor awesome!! 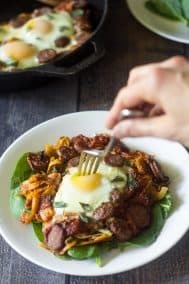 Served with Whole30 sausage for a great and satisfying bfst! Used 10’ Cast iron! Worked perfectly! Thanks so much! Hi! I love this recipe! Could I do any prep the night before so this is easy to throw in the oven the next morning? Omg this was delicious!! Made this and paired with homemade sausage. Party in my tummy. Thank you for this recipe. Hi! We made this over the weekend for the second time and it was delicious! I am trying to keep track of my calorie intake, and was wondering what the nutrition facts are? Thank you! Hi! We made this for the second time this weekend and it was delicious! I am trying to keep track for my calorie intake and was wondering what the nutrition facts for this dish? What is the calories for one serving if you cut into 6 slices? Delicious and easy to make. This recipe is a keeper. Am I missing nutrition info for this? If it isn’t, do you have it? It’s amazing buly the way! Hubby and I love it!! My favourite breakfast for all seasons but the hottest summer mornings. I always crave something sweet and this makes my cravings go away for a whole day. my kids love this as well! This is a delicious recipe. I get tired of eggs. I know this has eggs in to but you can’t tell it is so good. I know what you mean! The eggs sort of hide and the sweet flavors stand out. So glad you liked it! Is there a trick to keeping the eggs from scrambling when you add them and mix in? I whisked the eggs, mixed with coconut milk, and then added to the skillet. Do you remove from heat for awhile prior to adding?